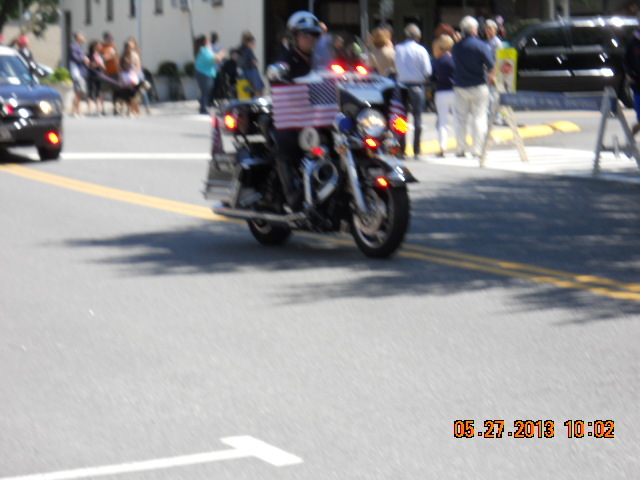 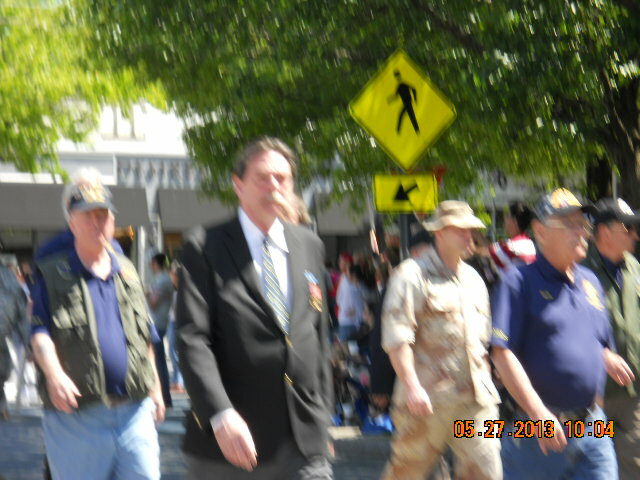 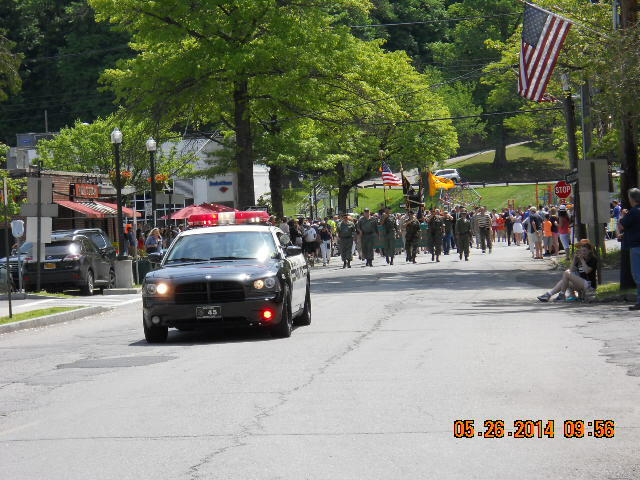 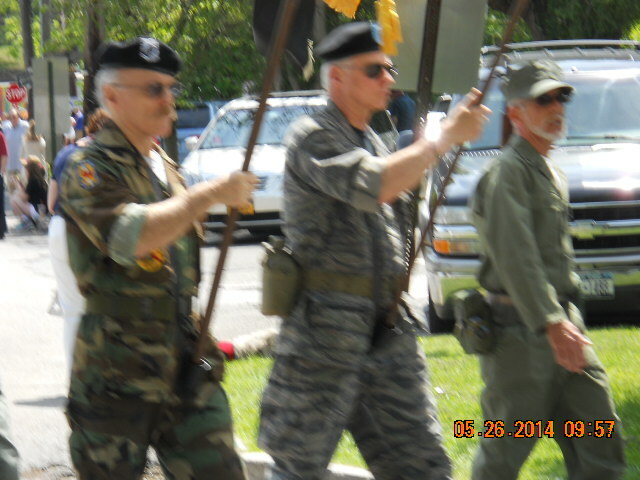 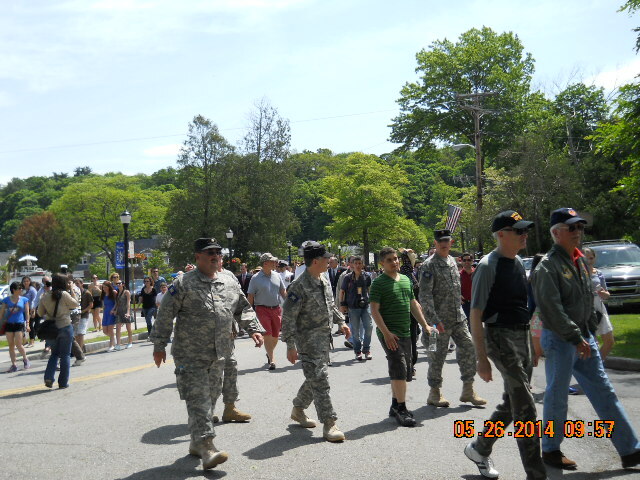 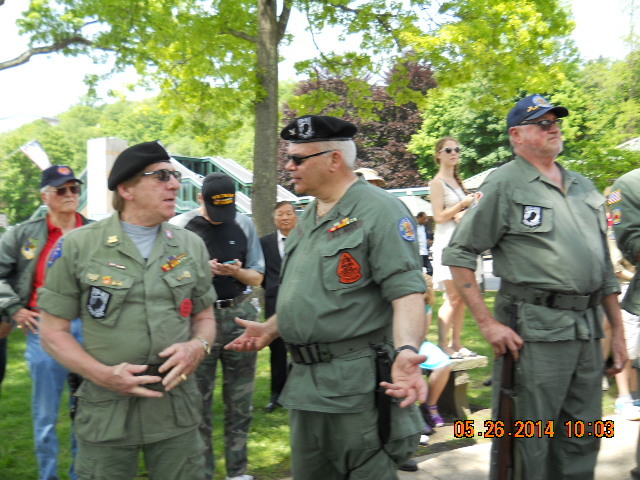 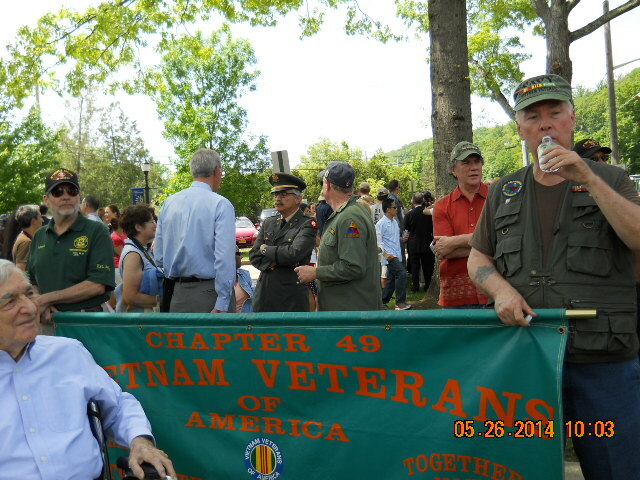 The vets were in perfect form along with all the uniformed services. 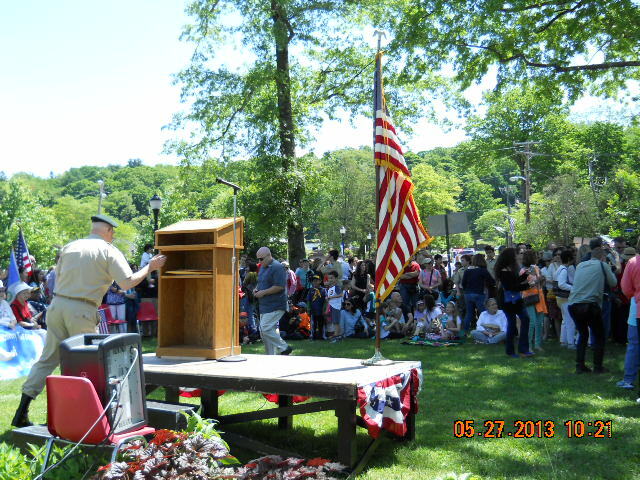 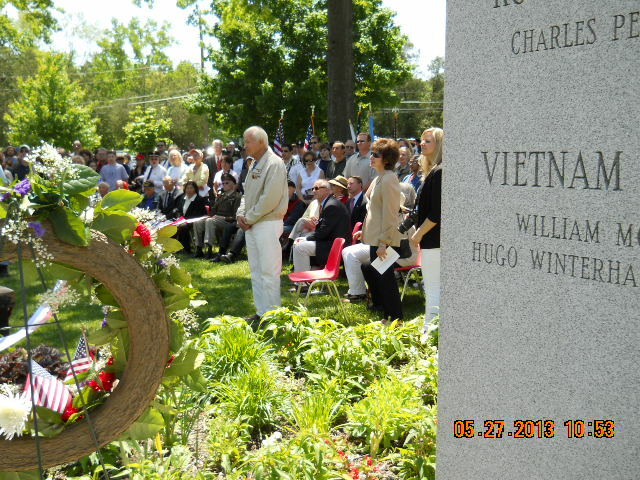 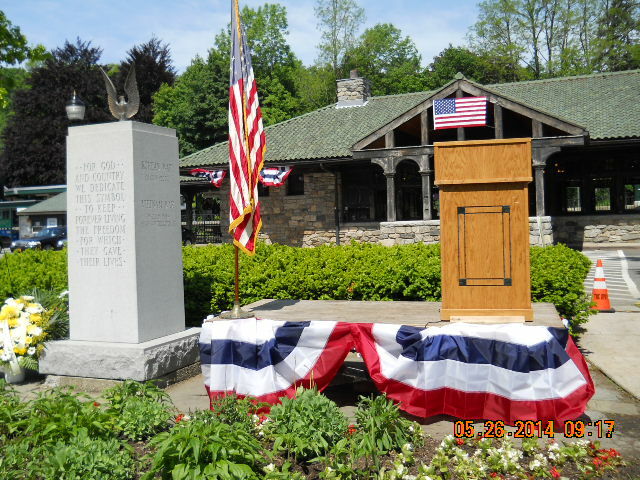 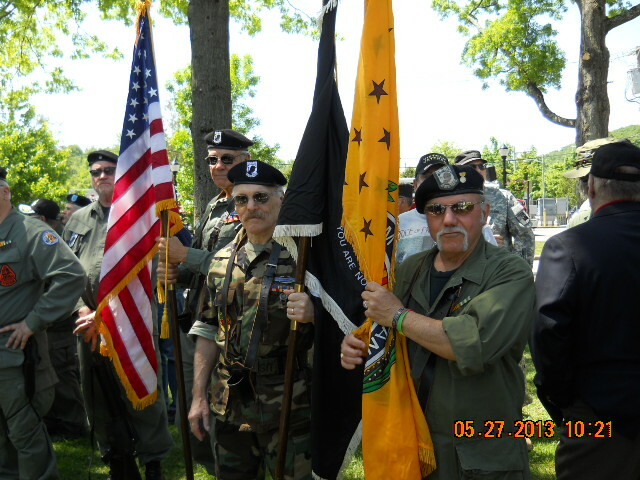 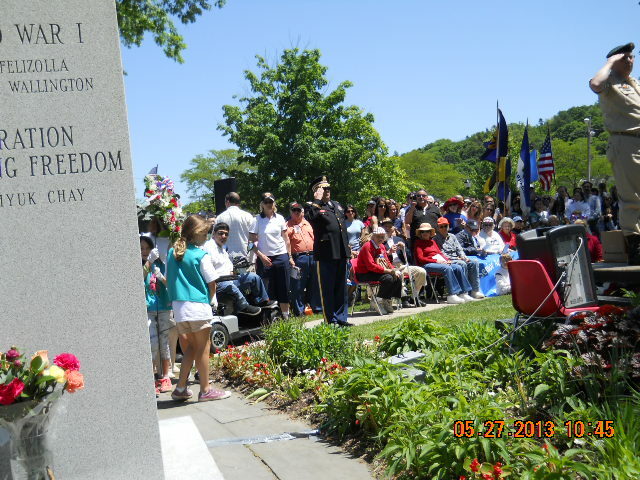 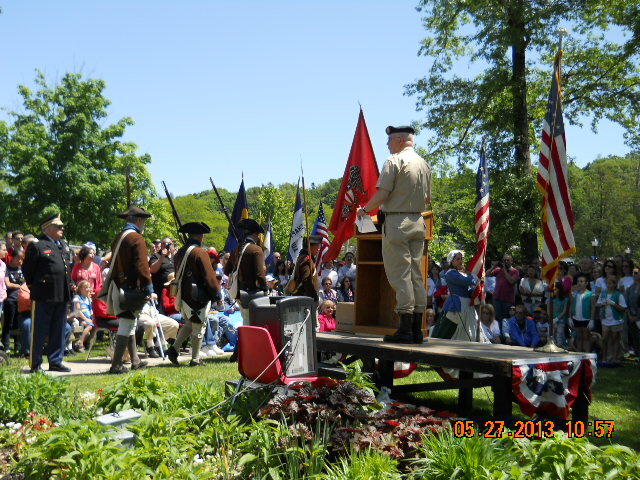 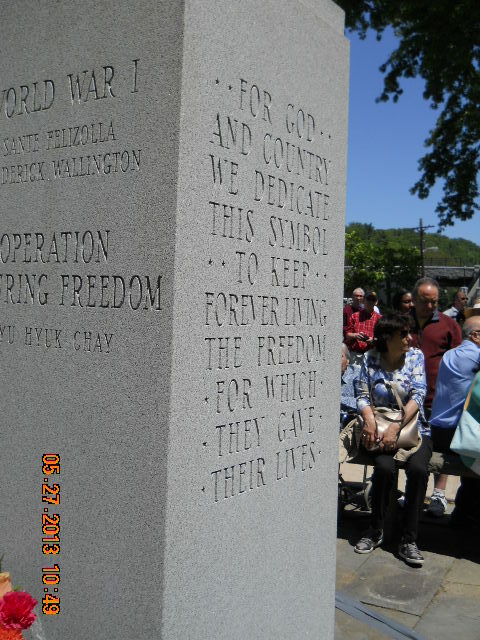 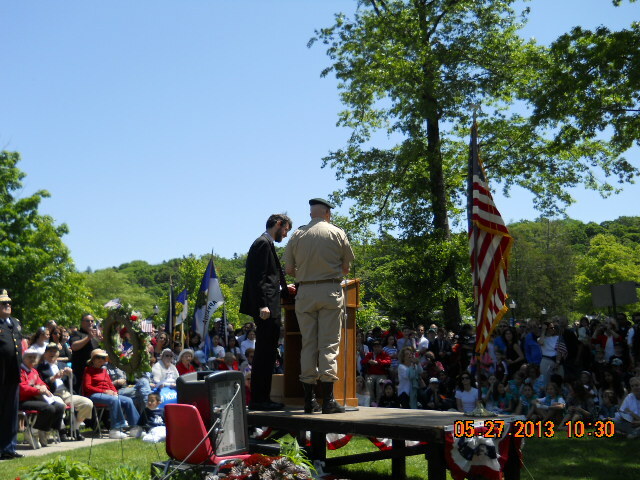 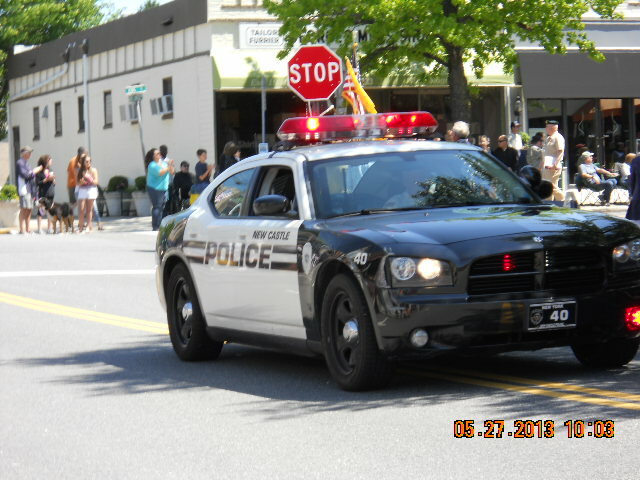 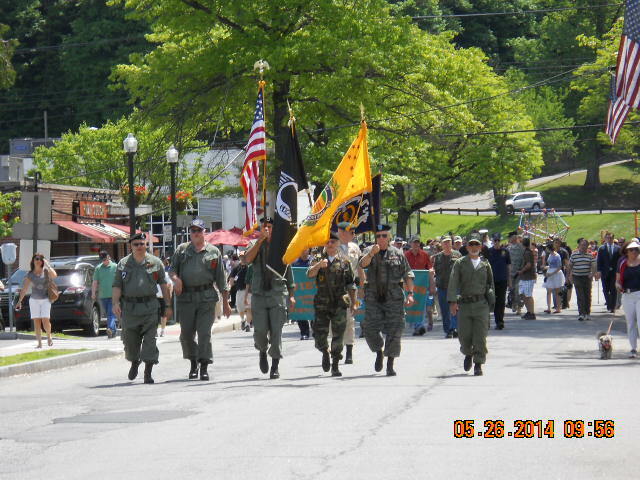 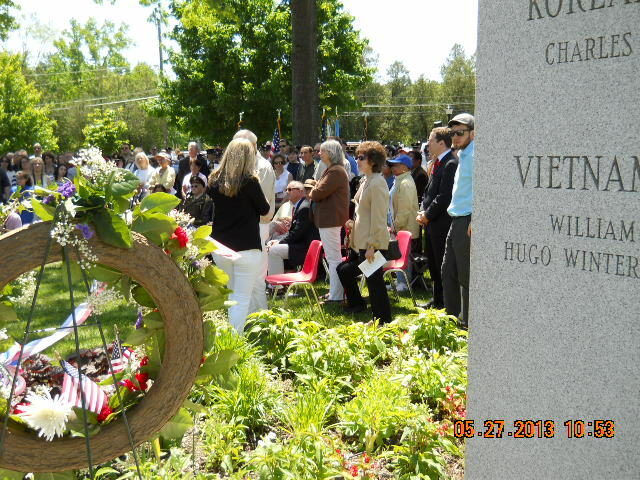 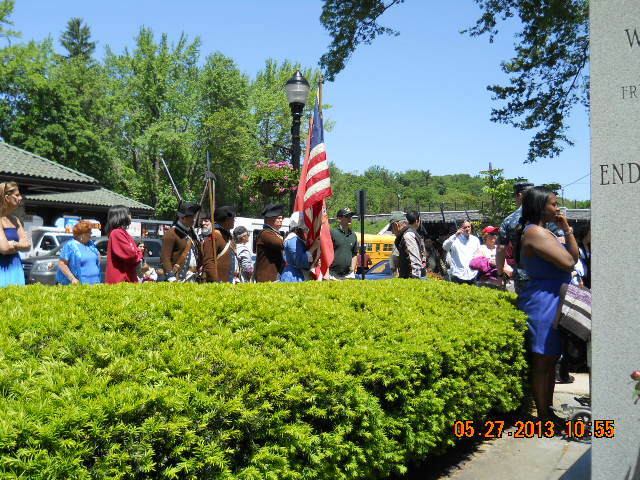 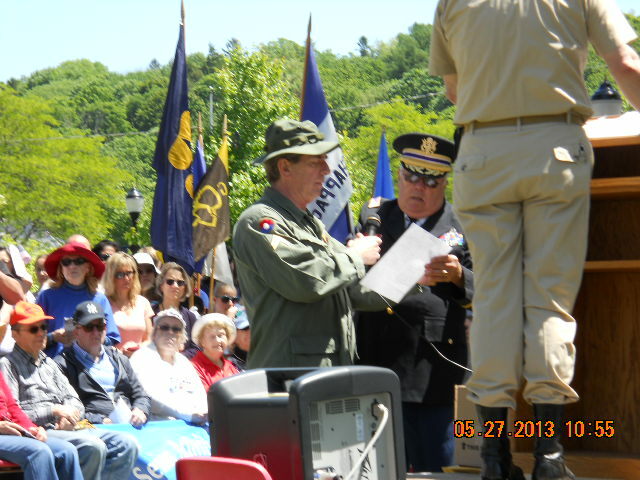 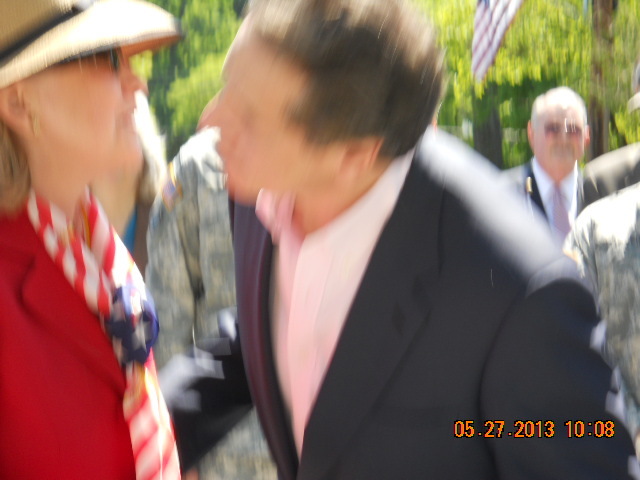 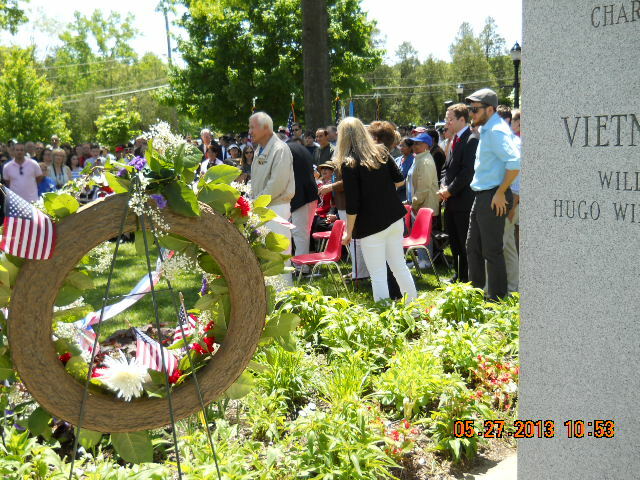 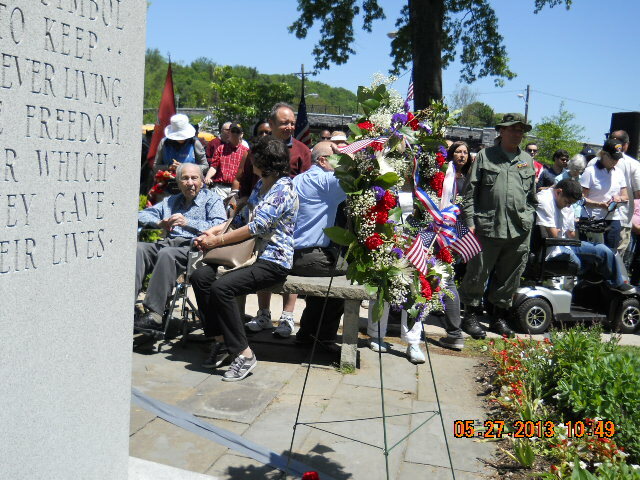 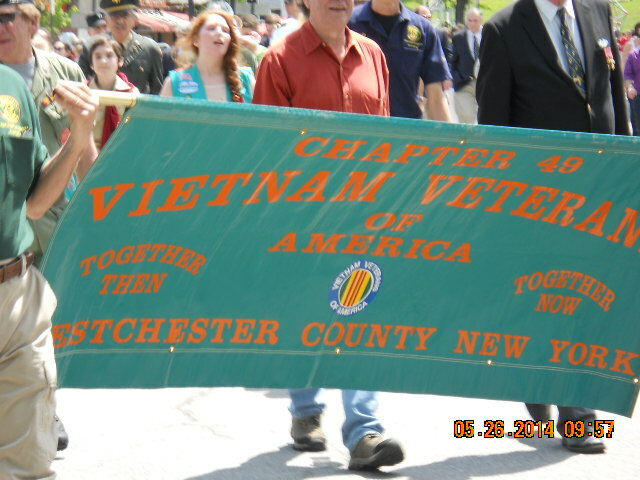 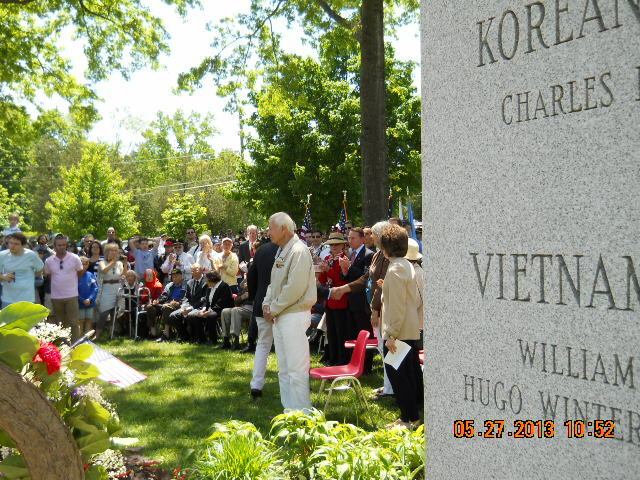 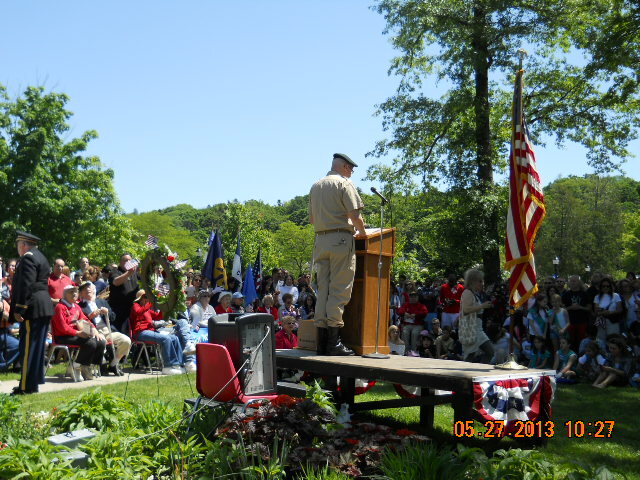 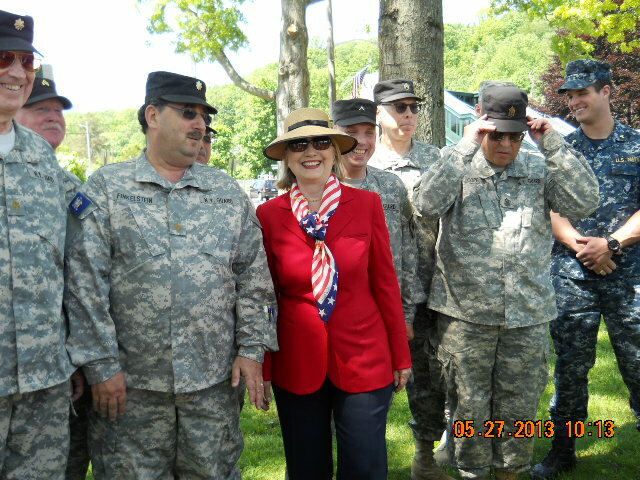 Chappaqua was declared a Purple Heart Town. 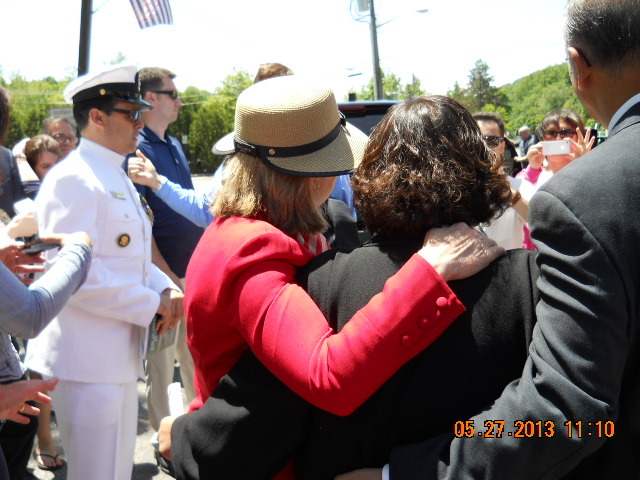 The bridge into town was dedicated to Army Staff Sgt. 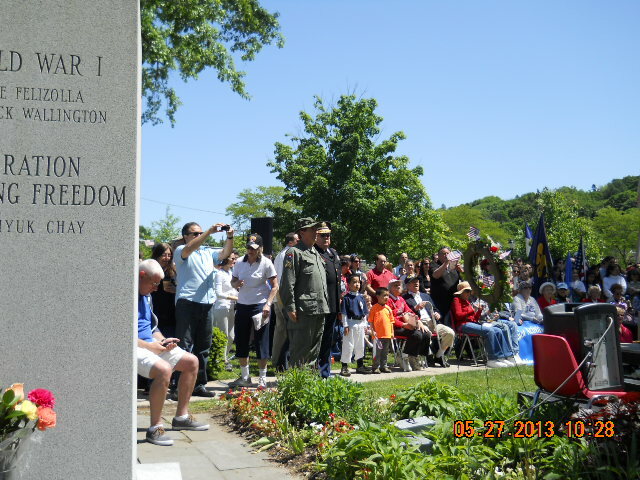 Kyu H. Chay who was born in South Korea, grew up in Mount Kisco, and died serving in Afghanistan. 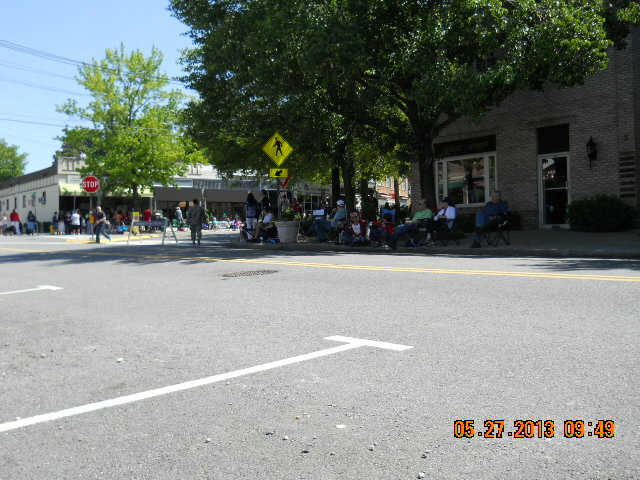 The weather was perfect, beautiful, warm, and sunny. 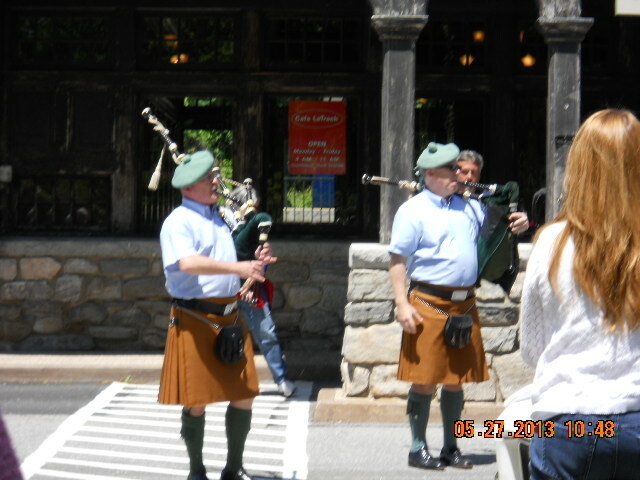 The Greeley High School band and the Kerry Pipers were in perfect and touching tune. 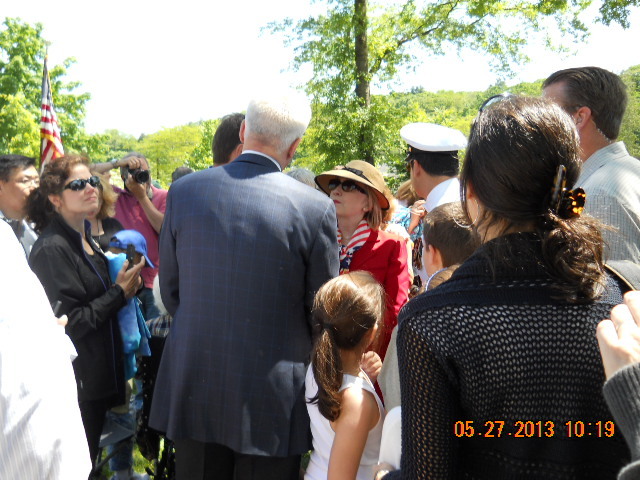 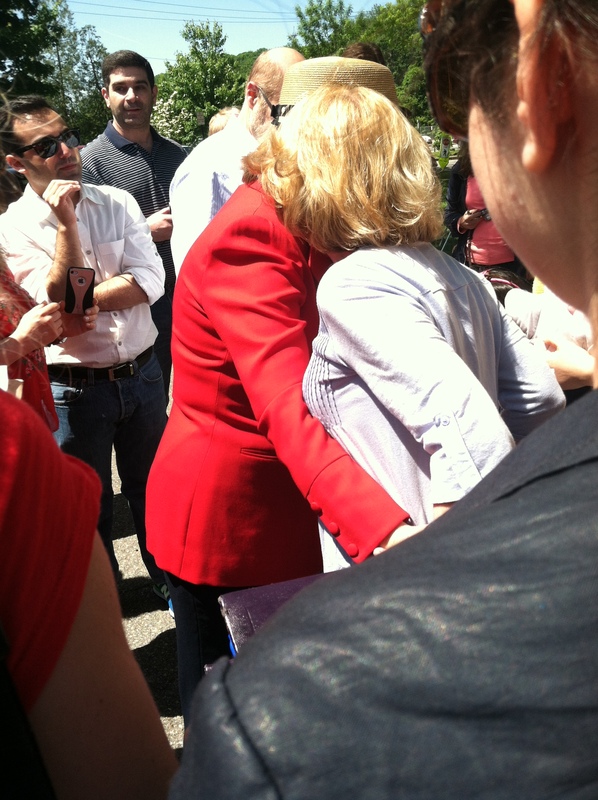 Hillary Clinton was swarmed by admirers. 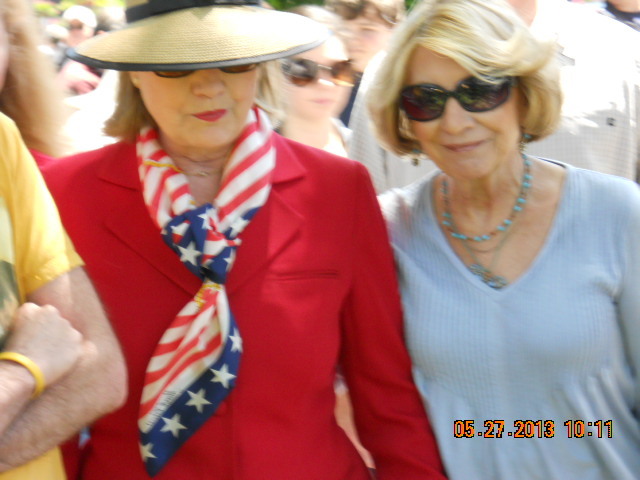 A few long-time Hillary buddies showed up. 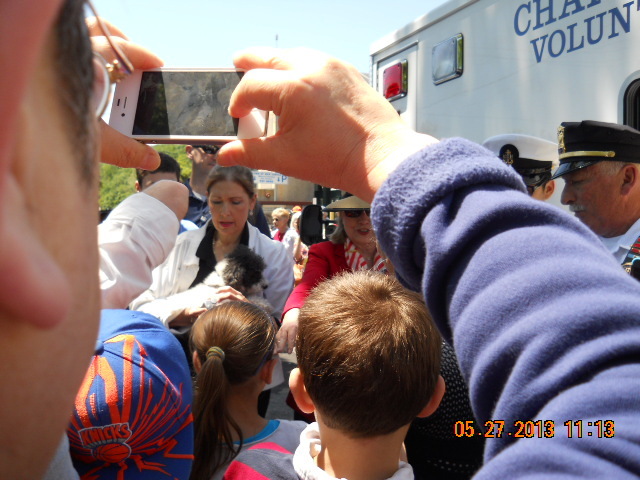 Of course Maggie Mae, pup reporter, was on the scene with her mom and collaborator, Ronni Diamondstein, and channel 12 and channel 4 news. 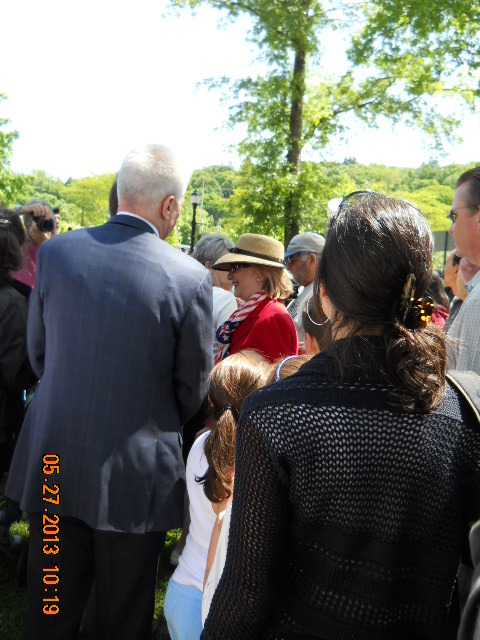 Ronni was interviewed by channel 4. 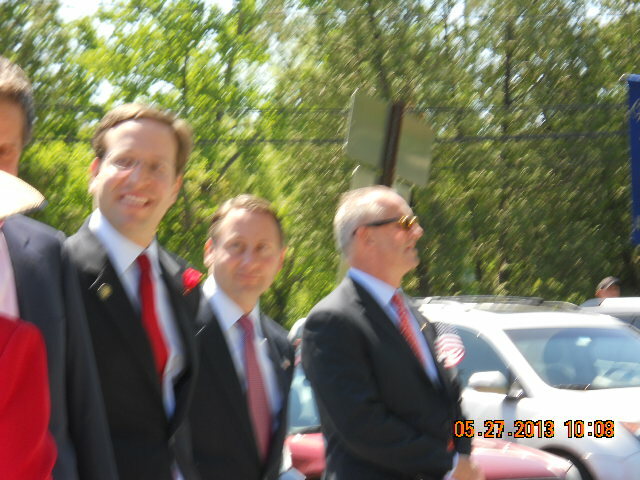 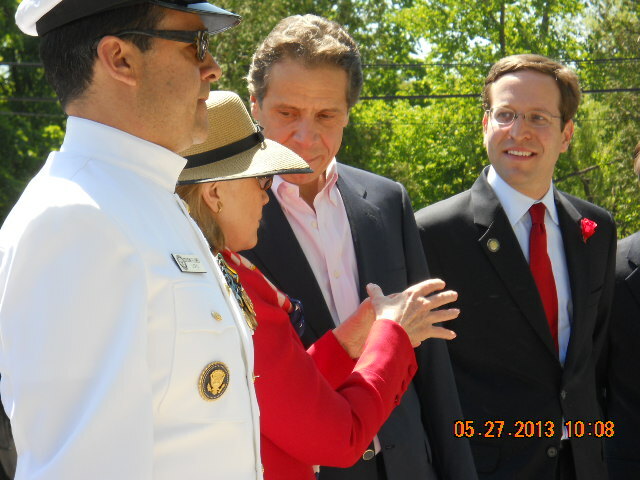 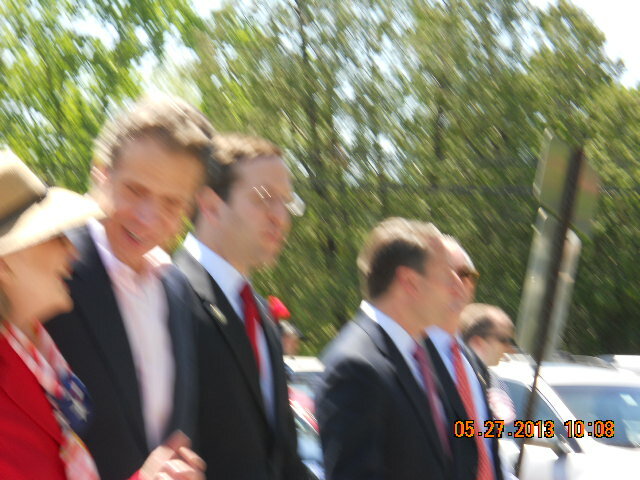 Governor Cuomo, who lives there, was on Staten Island at another parade, and his opponent, Rob Astorino marched with Hillary. 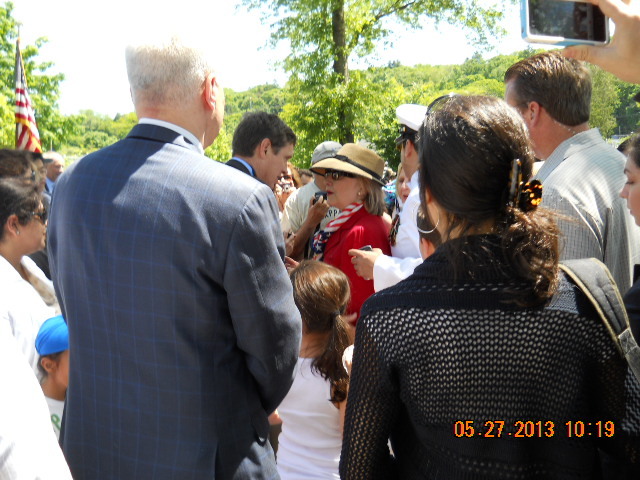 It was a lovely, and special day. 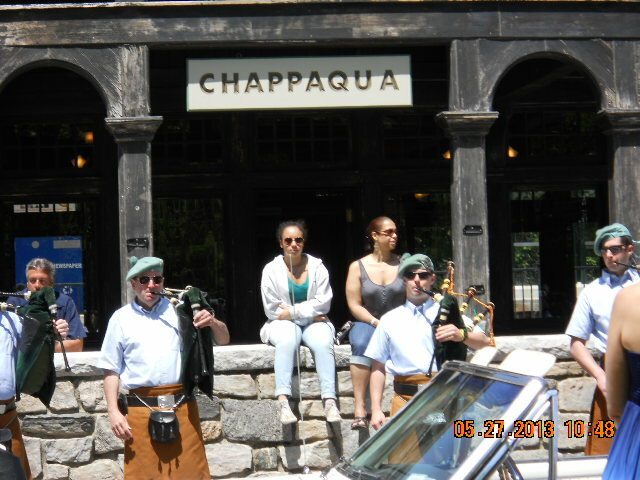 Many thanks to Ronni Diamondstein for this lovely article in the June issue of Inside Chappaqua Magazine. 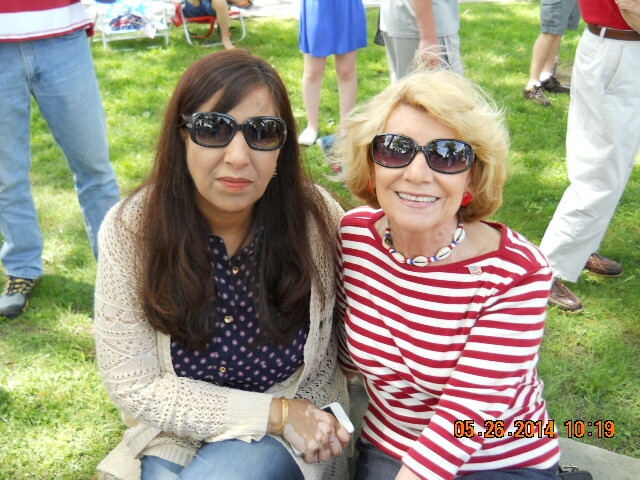 Thanks as well to the awesome Grace Bennett, founder and publisher of the magazine and recently celebrated its 10th anniversary. 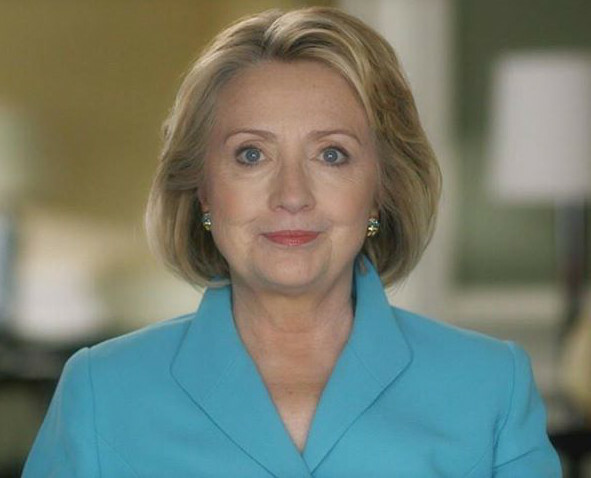 It is so nice to see Hillary Clinton’s important work and this blog promoted this way. 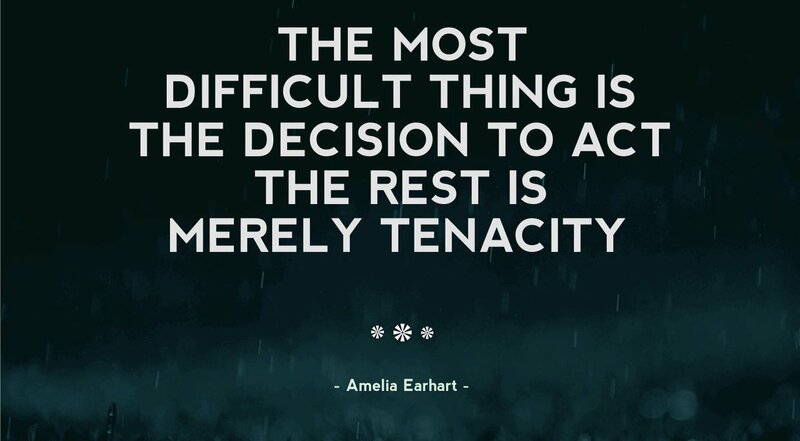 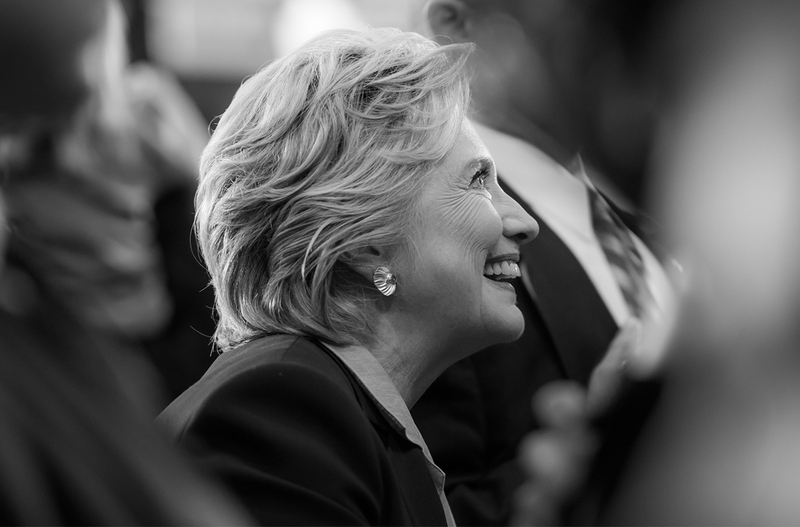 There’s no doubt from the media buzz around Hillary Clinton’s future since she left the office of Secretary of State that many people, not only in Chappaqua, but across the nation and world, have not given up hope that she will fulfill what many see as her destiny. 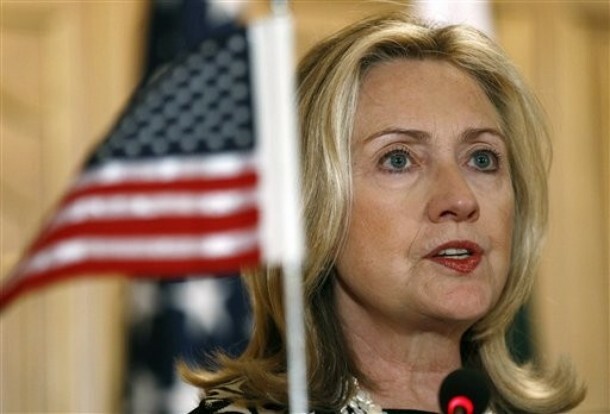 Numerous websites and blogs have followed Clinton since she lost the presidential nomination in 2008, and more are sprouting up now that her future political plans remain a mystery. 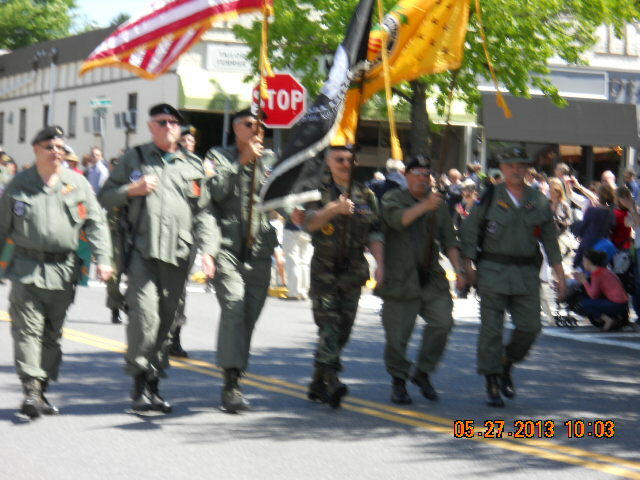 You can find them on the web, on Facebook and Twitter. 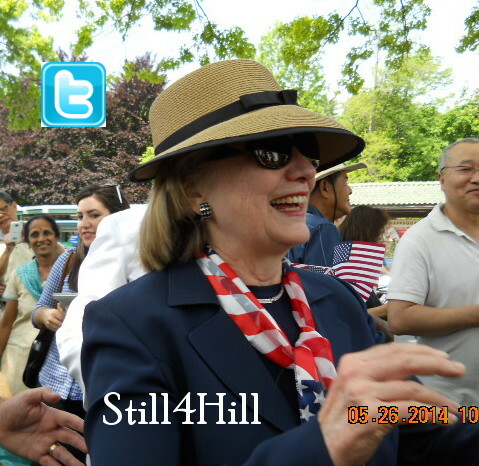 Still4Hill continues to be one of the most prominent. 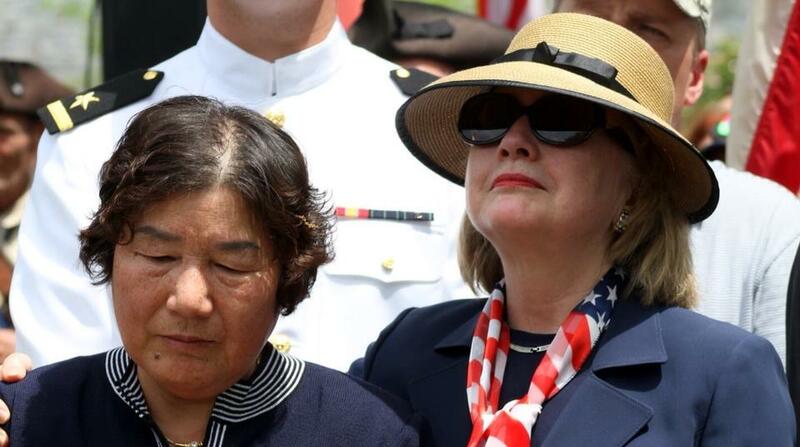 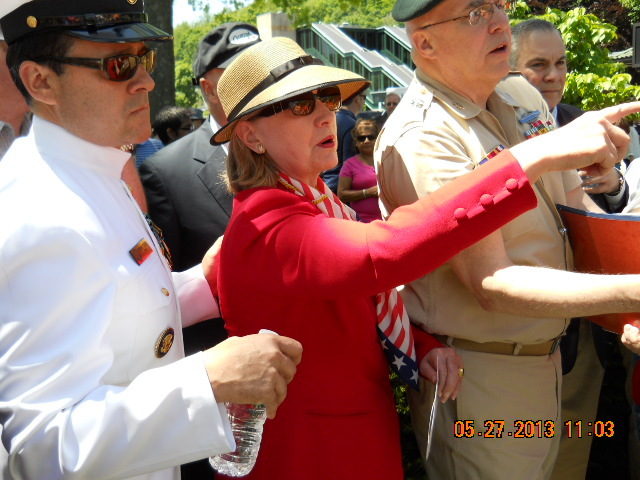 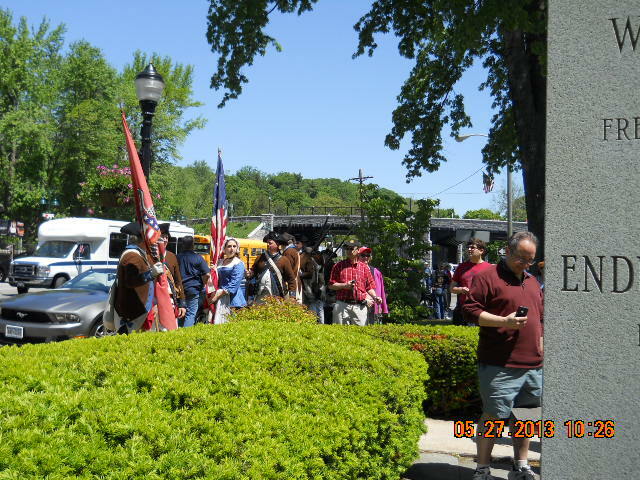 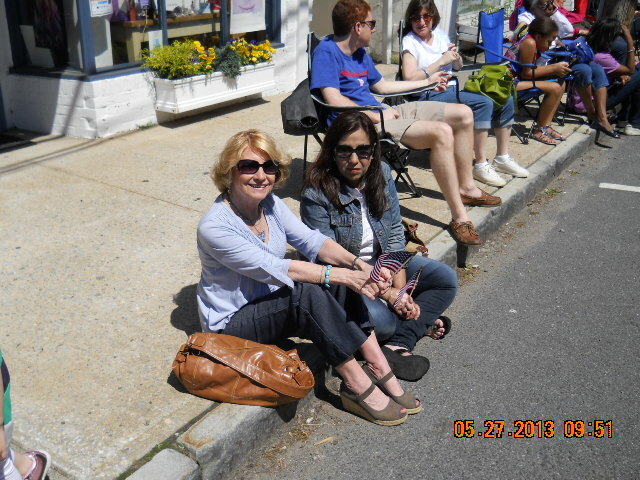 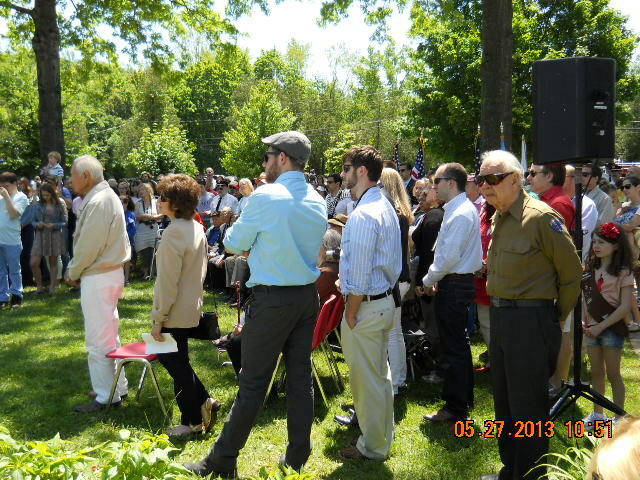 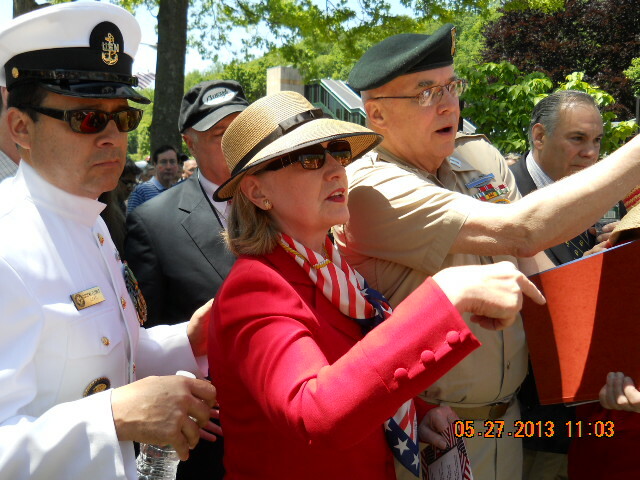 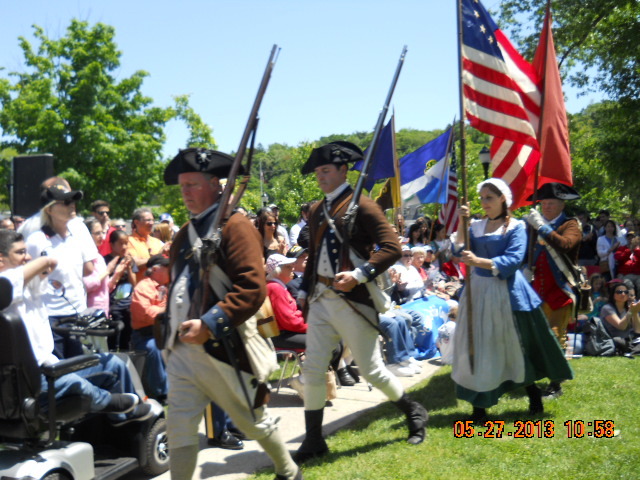 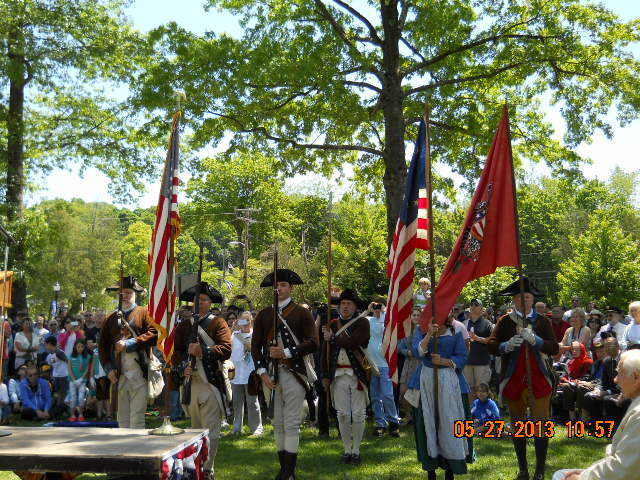 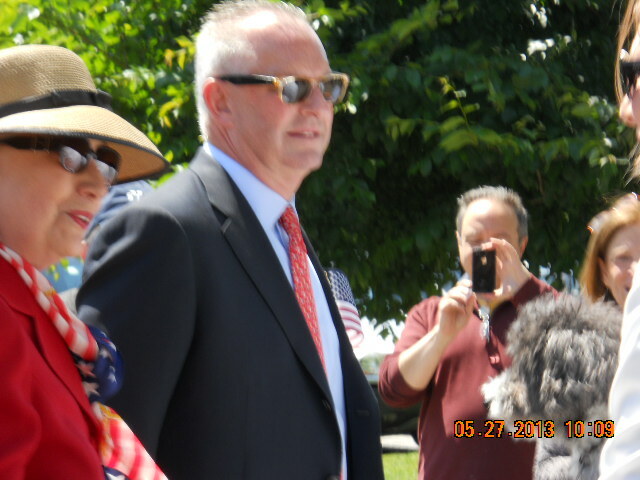 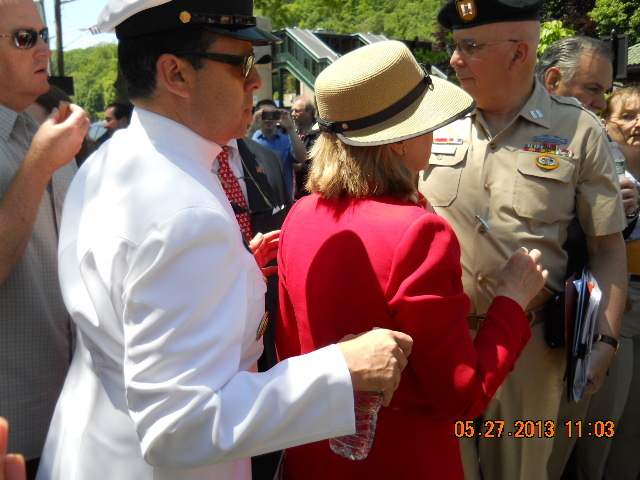 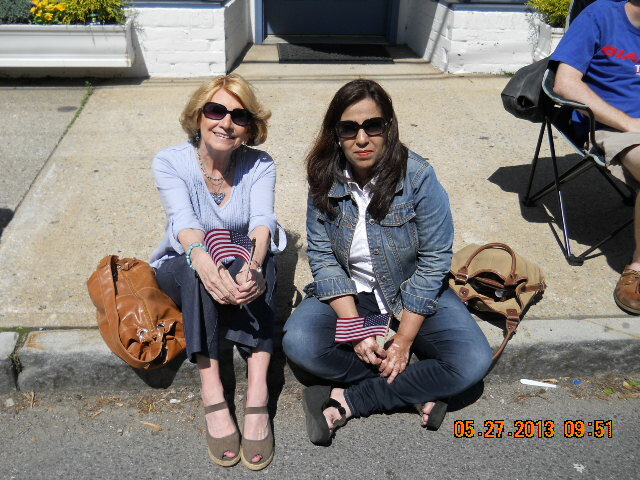 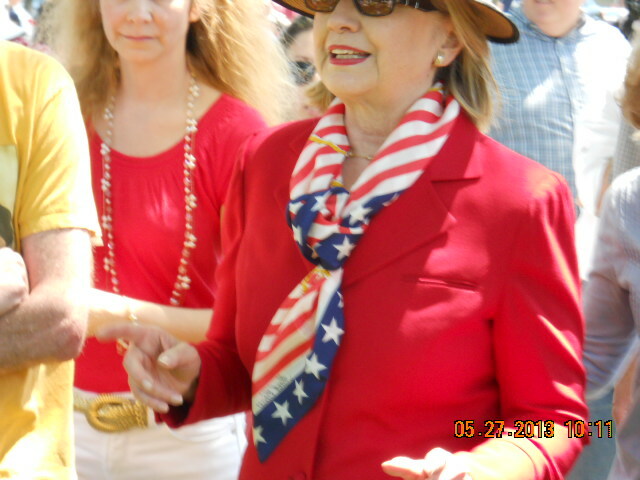 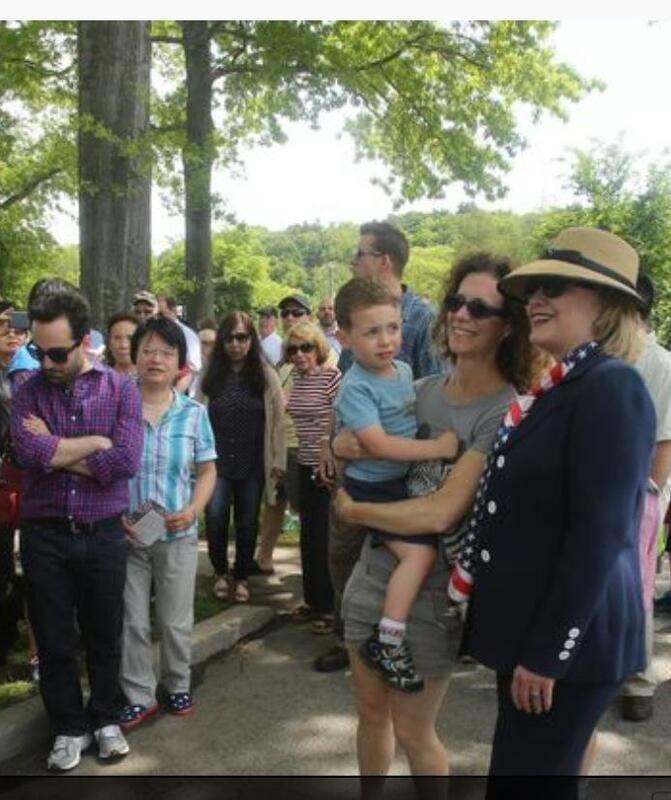 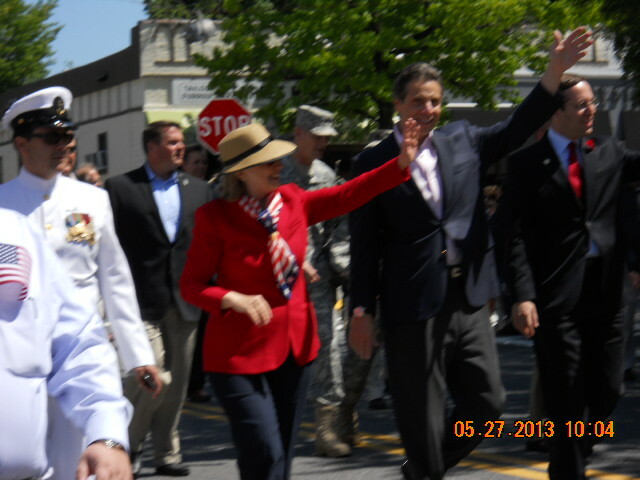 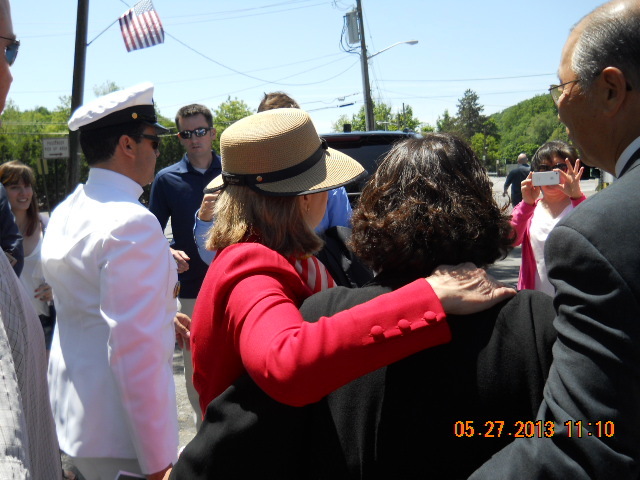 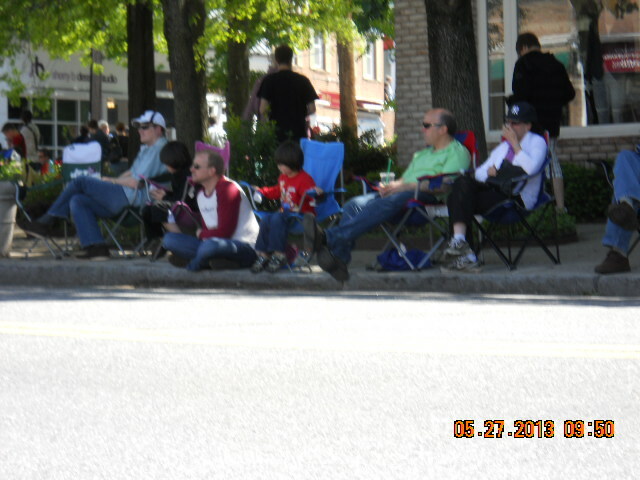 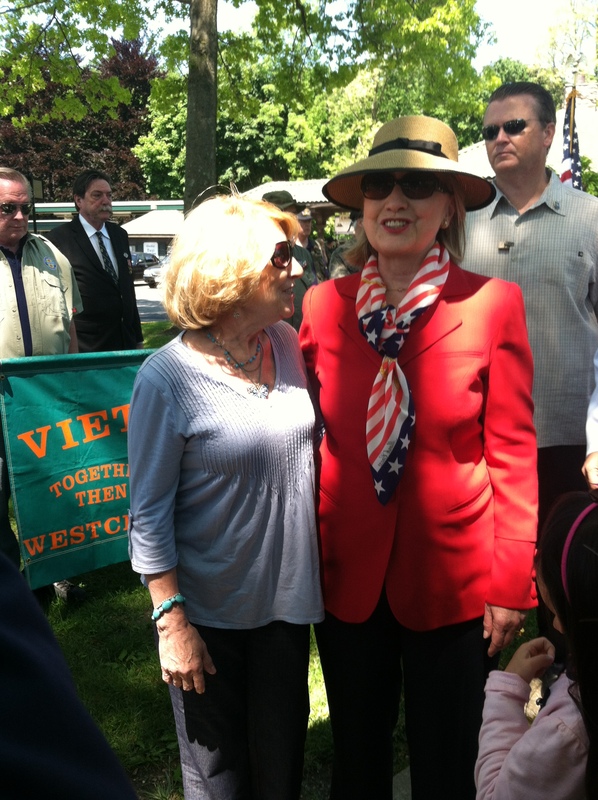 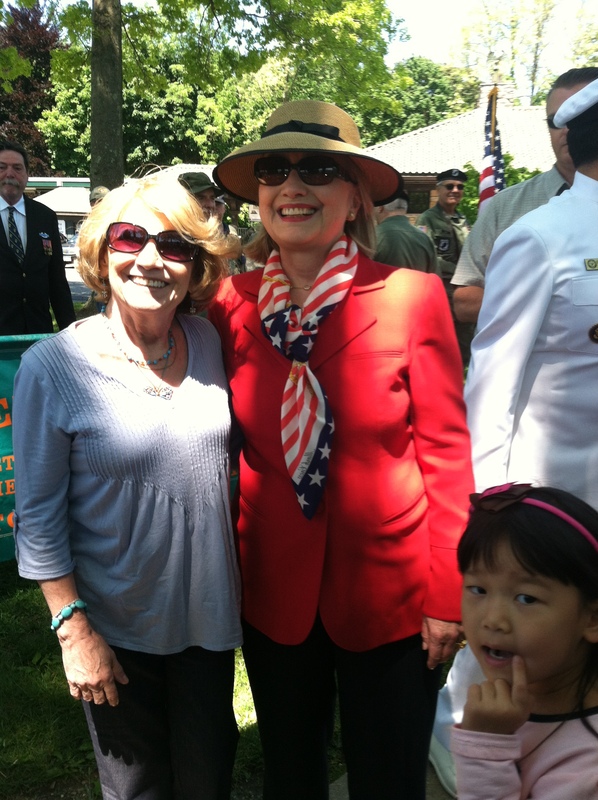 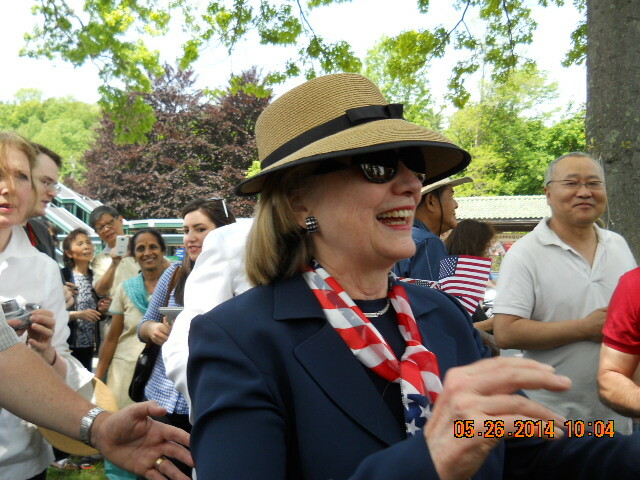 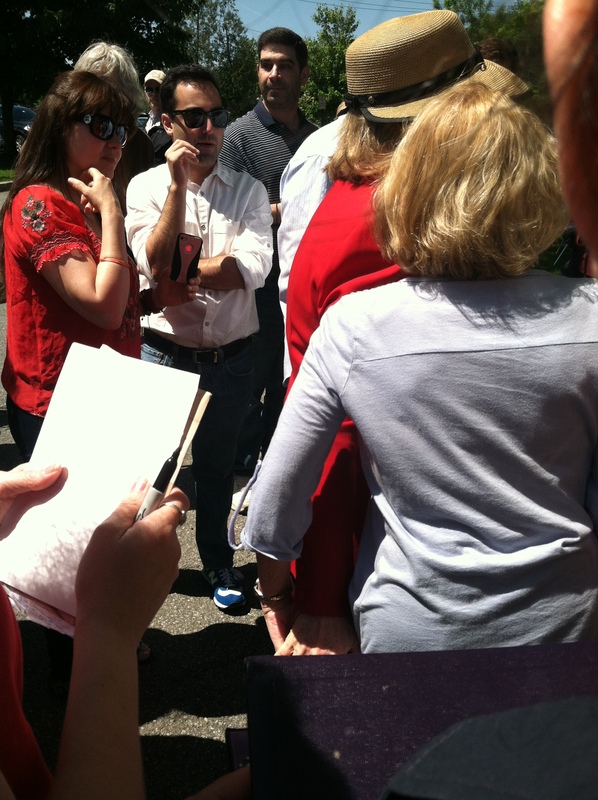 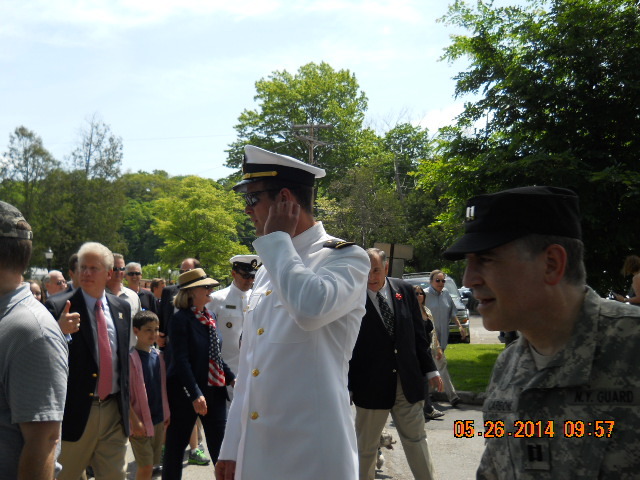 It was a perfectly beautiful day, and I was lucky enough this year to meet up with a group of Hillary friends for the Memorial Day parade and ceremonies. 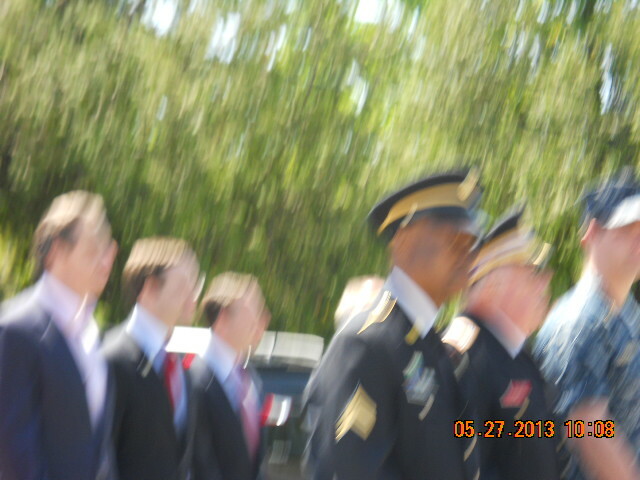 In addition to the pictures I took myself, I have some shared by friends. 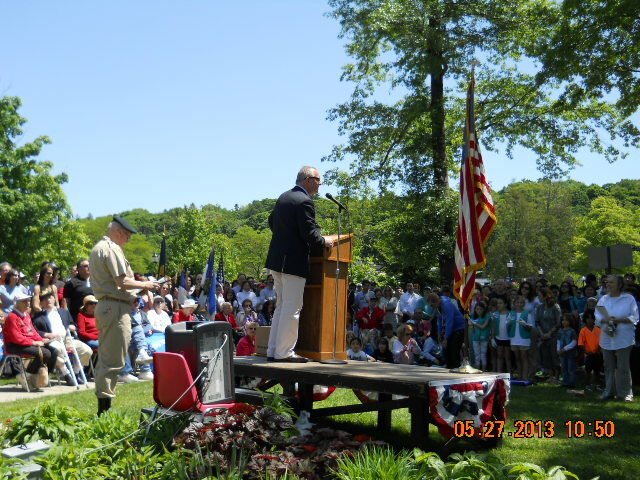 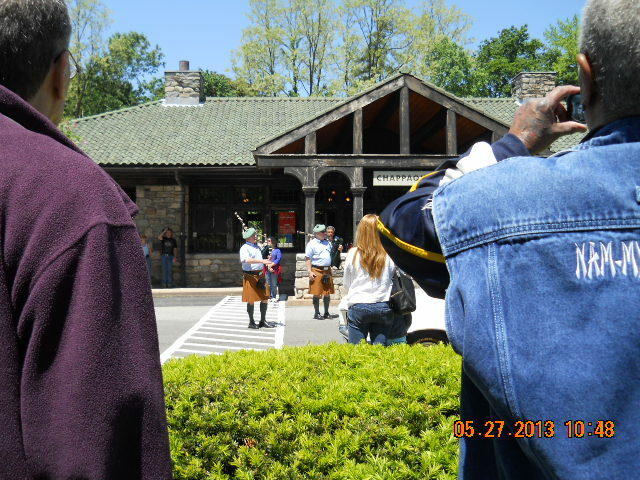 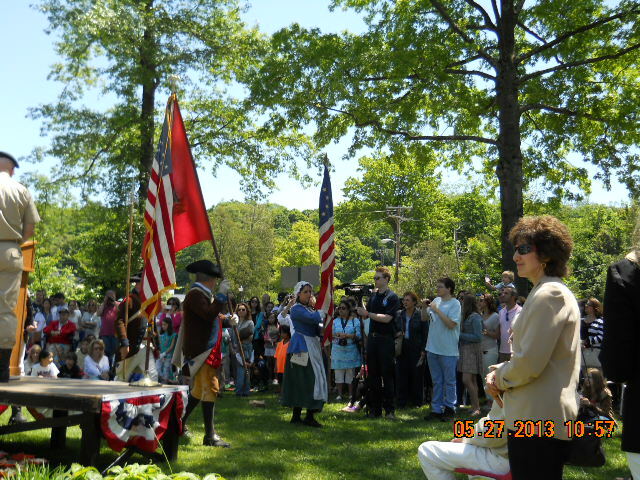 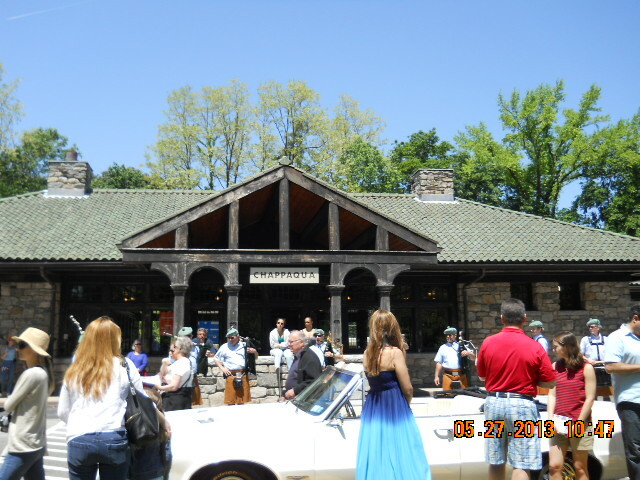 There were wonderful pipes and drums, and the Horace Greeley High School band played flawlessly. 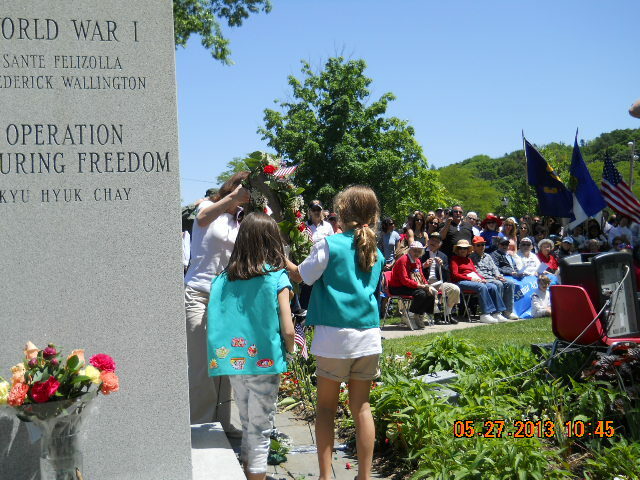 Girl Scouts of Troop 120 placed the wreath. 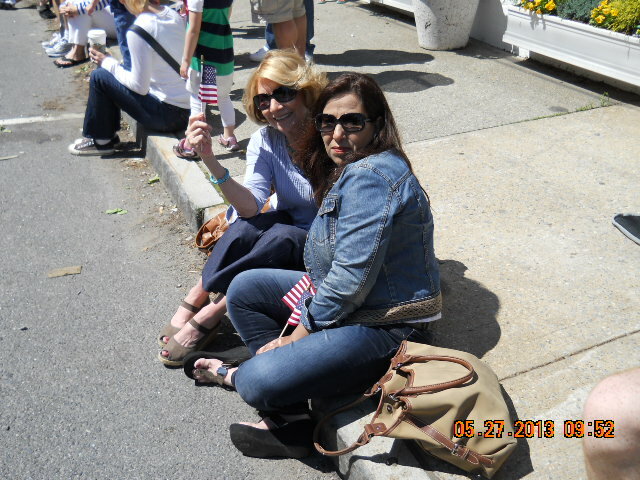 It was great to see girls doing it. 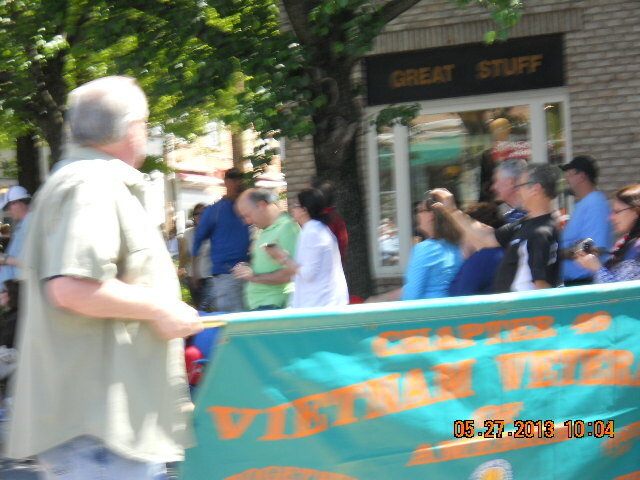 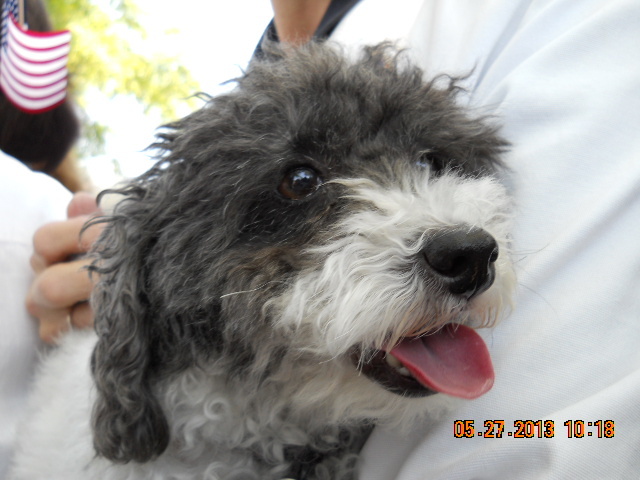 There were many, many dogs, some with flag bandanas, and all were well-behaved throughout. 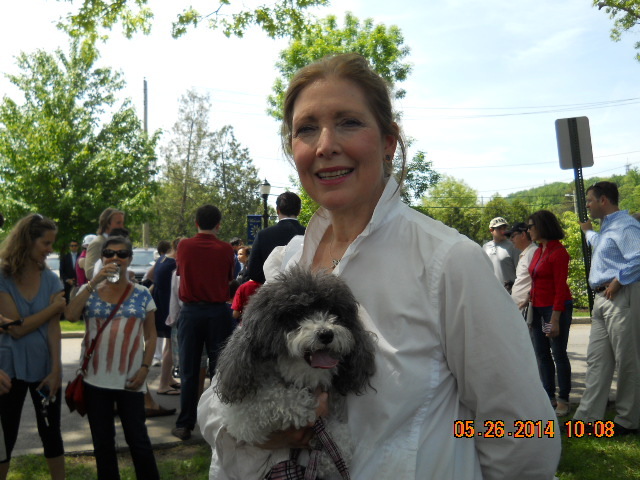 One special doggie I finally got to meet was Maggie Mae, Pup Reporter, who writes a pet column for Grace Bennett’s Inside Chappaqua Magazine. 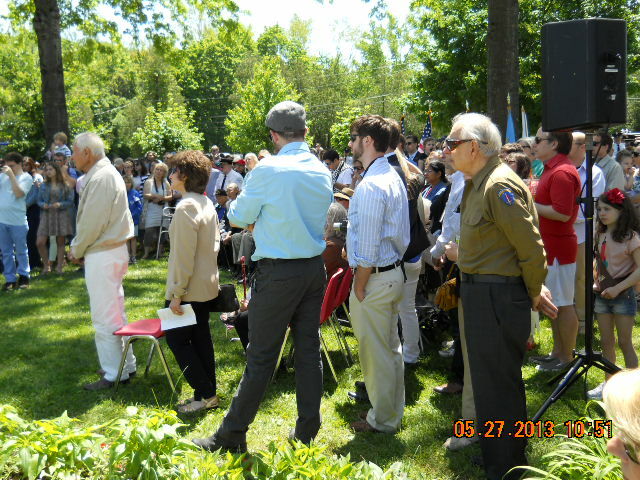 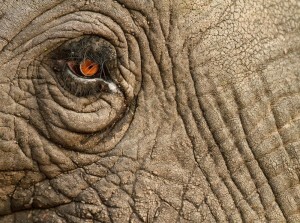 Maggie’s mom, Ronni Diamondstein, has written an article featuring this blog for the June issue. 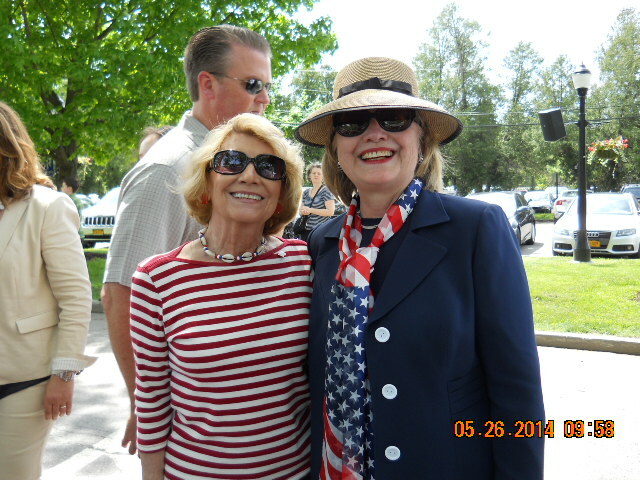 Ronni and her canine cub reporter had their picture taken with Hillary. 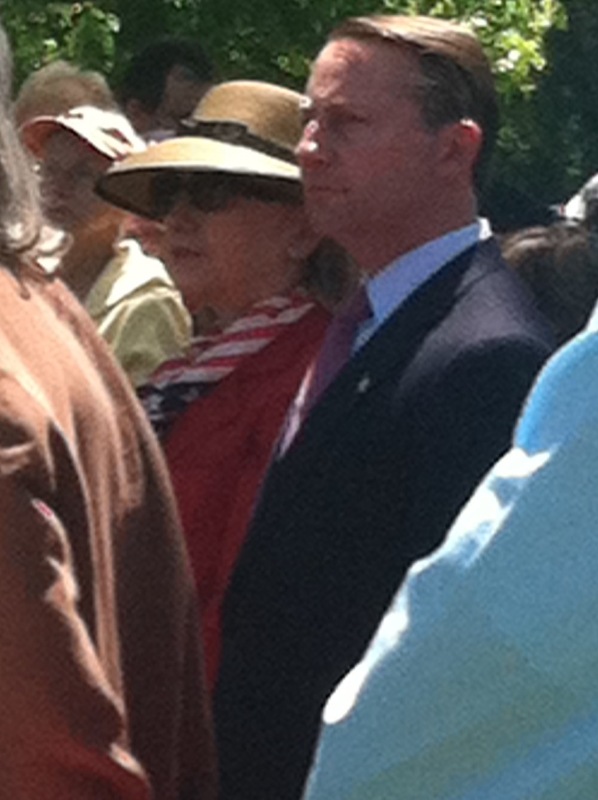 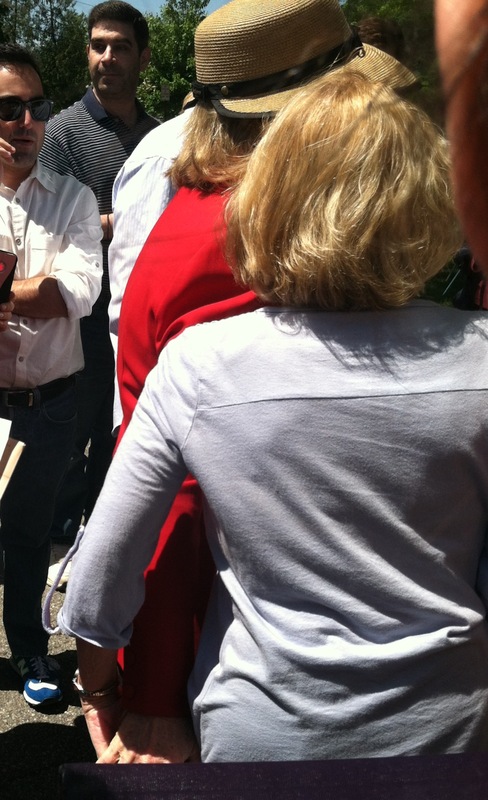 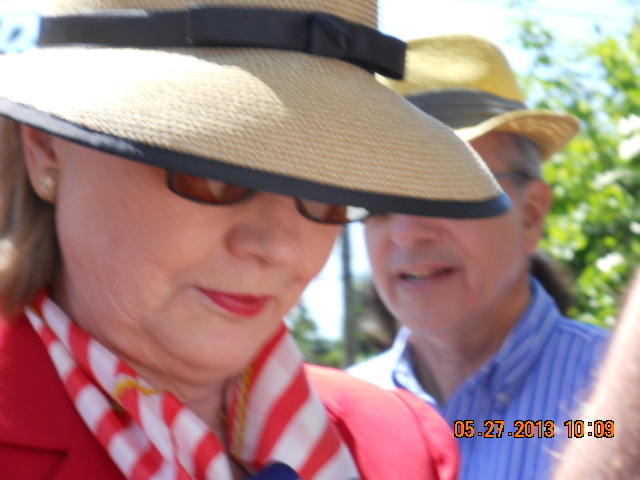 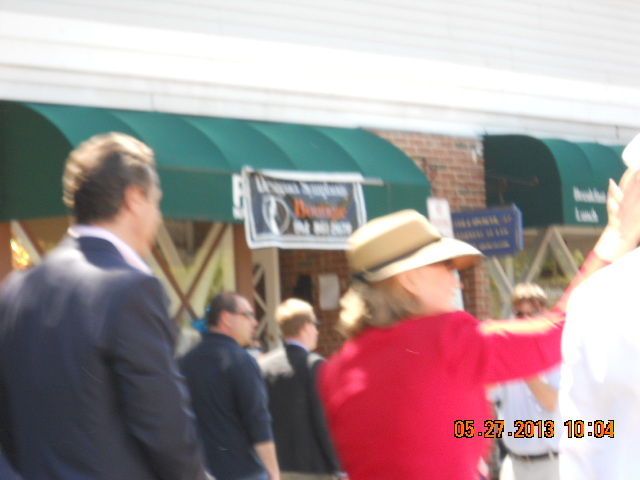 It was very hard to get close, but I cropped a few where you can see Ronni and Hillary. 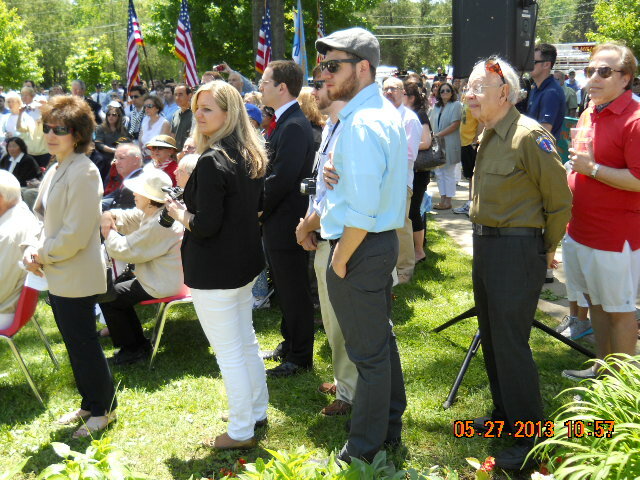 In one shot, you can also see Maggie Mae. 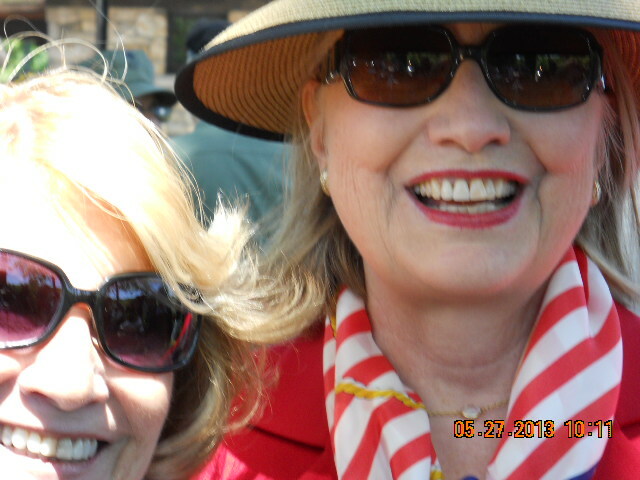 I want to thank especially Rumana Alvi, Sharon Yarborough, and Rosemary Rowlands (who had her picture taken with Hillary) for sharing their images with me. 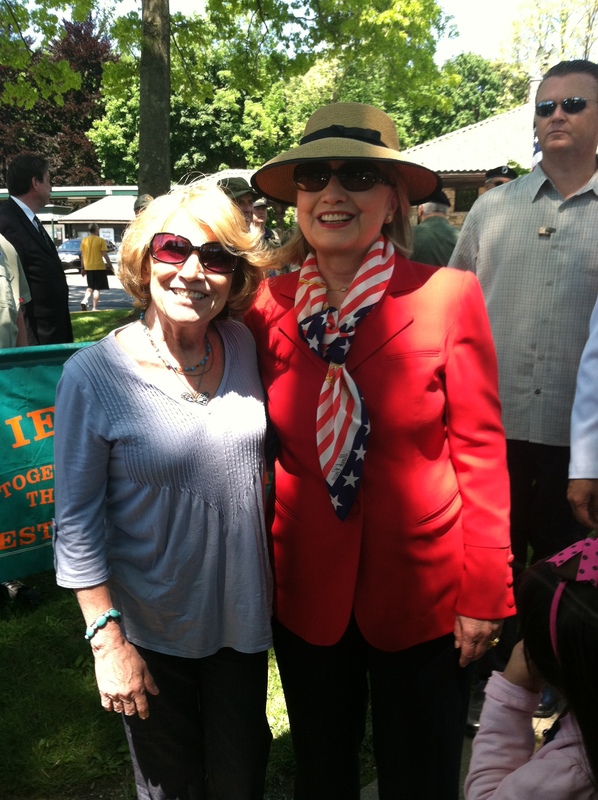 It was a wonderful day, and yes, I did get to talk with Hillary. 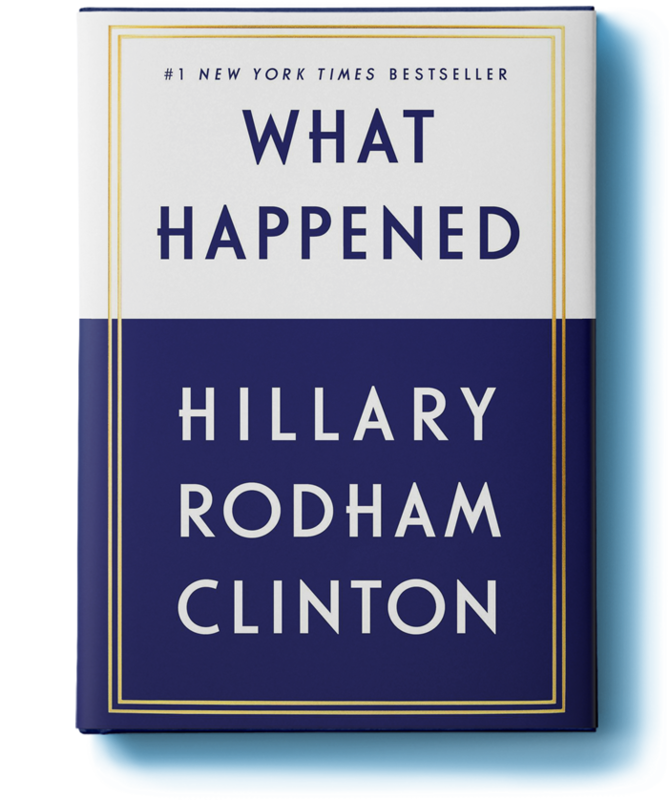 No, it was not about 2016. 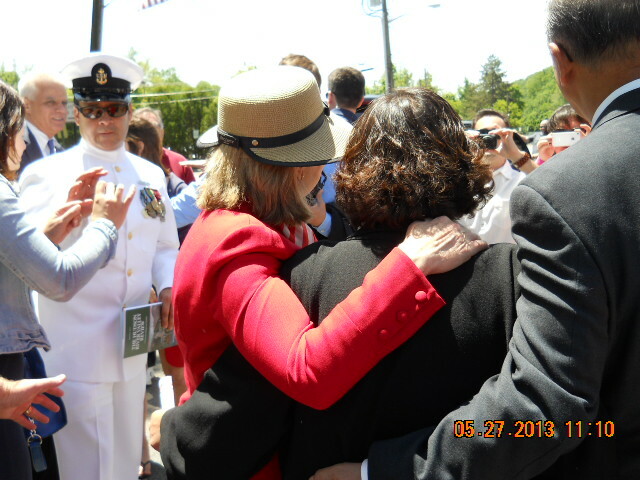 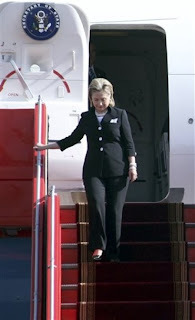 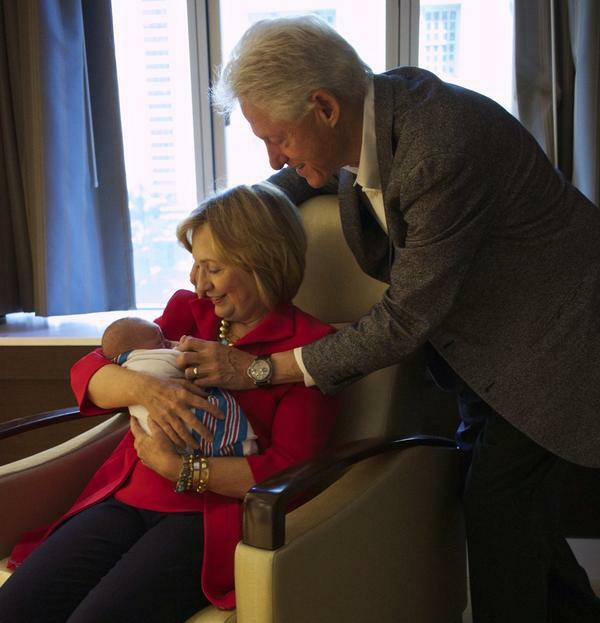 Sorry, but as I have said here often, that is the best way to waste your two minutes with Hillary Rodham Clinton. 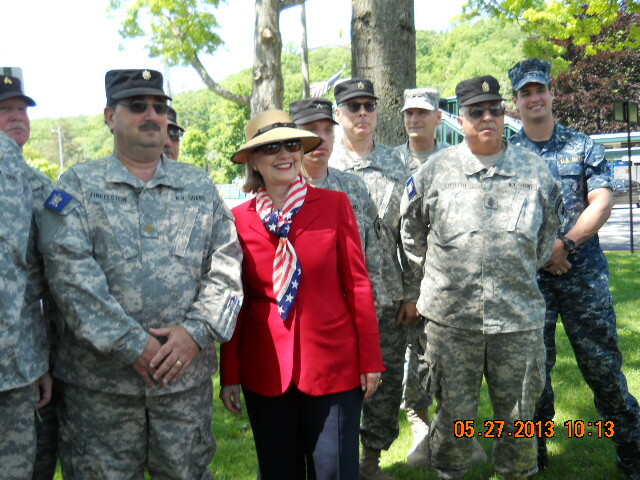 What a beautiful day with a beautiful lady and her loyalists in her hometown! 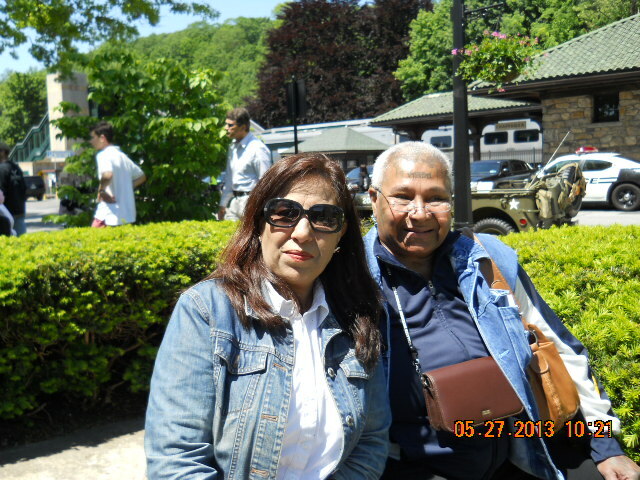 I would like to thank Mme. 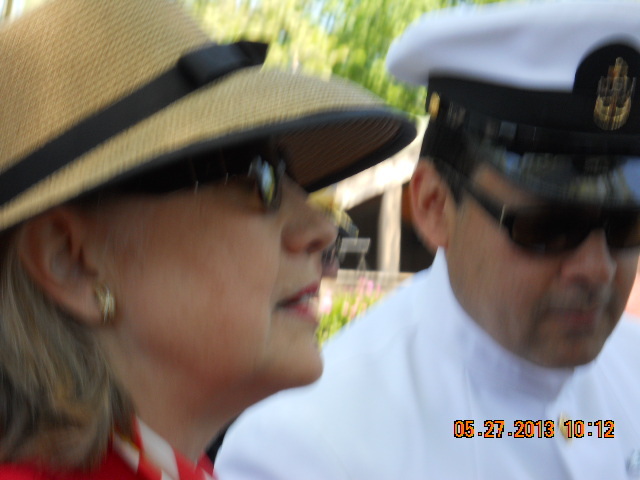 Secretary for her kindness and patience taking time to meet me. 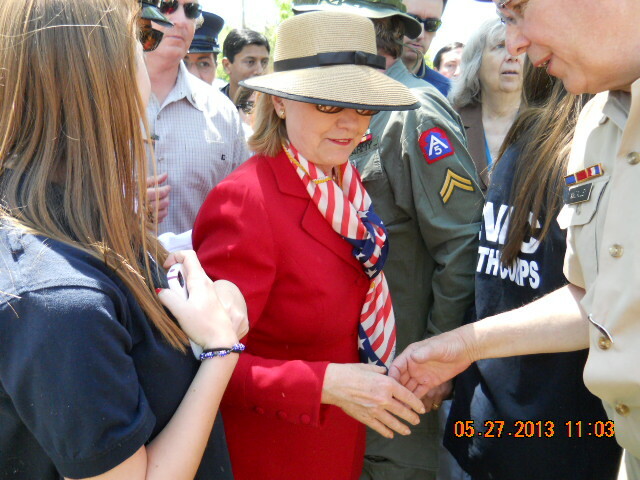 She is most gracious and generous. 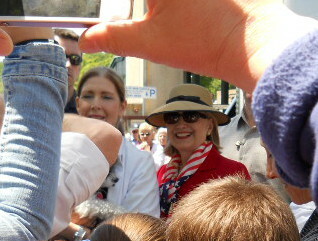 One thing I forgot to ask – I was so blown away by her kind attention – was how I could get her press releases.